What’s better than chilling by the beach with van by your side and a beer in your hand? Well, how about relaxing in one of the most important van life essentials that al vandwellers need – a travel hammock. Now, that’s what I call a good day! 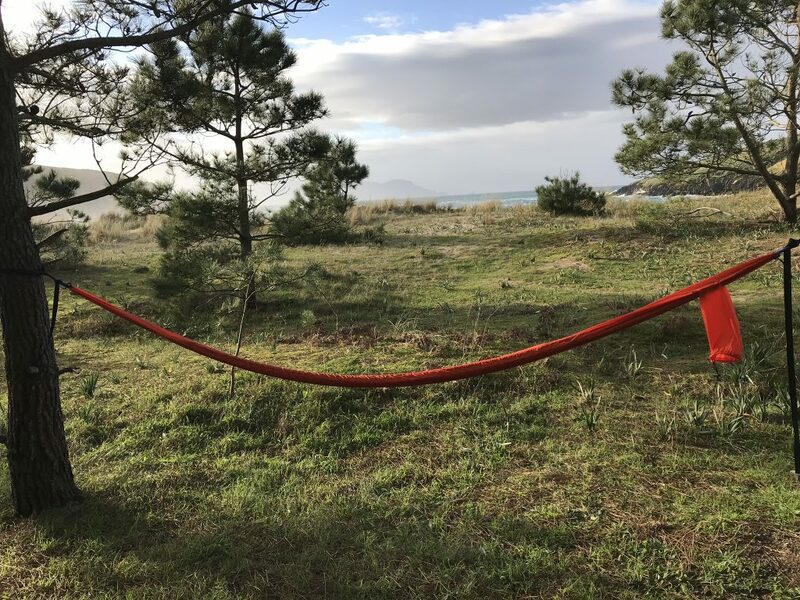 Van Lifers and Weekend Warriors, today we’re reviewing the creme de la creme of lounge gear; a beautifully made string travel hammock brought to you from Viva Maca, an ethical company based in the USA. Viva Maca’s hammocks come in three different colour waves; ‘The Uxmal’, neutral colours – think fashionable creams and whites; ‘The Coba’ which is made up of cool blue hues, and ‘The Edzna’ comprising of warm colours, bright reds and oranges yarns that look as though they’ve been pulled straight out of the sun. Oh yes, and more! I’ve been an avid travel hammock user since I was about 12-years-old, and I always managed to find a way to fit a hammock into my bedroom and later on my house. 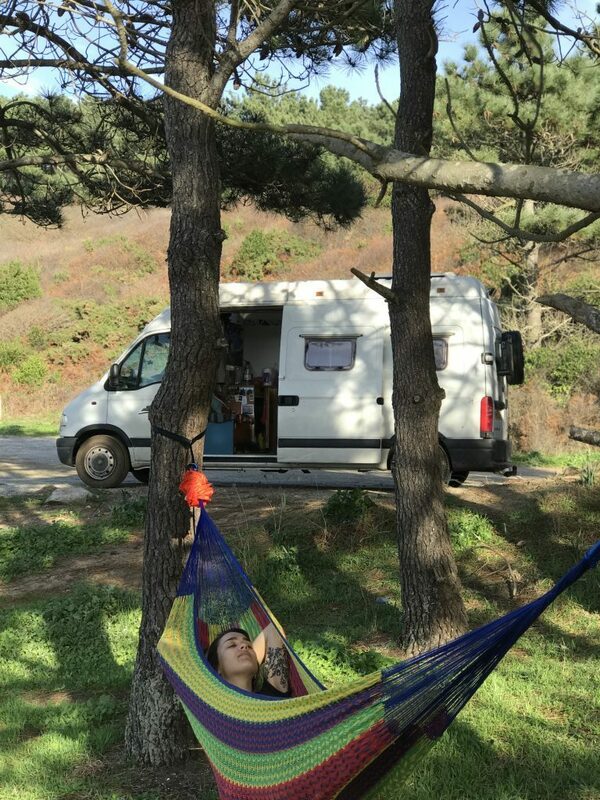 When I moved into my camper conversion and started travelling in a van my hammock time reduced significantly; the hammock that we brought with us was too bulky in our small space, and it was always a chore to set up outside. In came Maca Hammocks to the rescue, and now you can’t get me out of it for love nor money! Viva Maca’s travel hammocks pack up so small that you can easily fit one inside your day bag, still leaving plenty of room for any other gear for off grid living. They’re great campervan gifts for any traveller in your life, and they’ll easily fit into bulkheads, drawers, or even in that tiny nook behind your shoe rack. Once packed down, the drawstring carry case (included with every hammock and which also holds the straps to hang the hammock from) measures roughly 30cm long by 10cm wide and only weighs 2.5lbs! Is This Travel Hammock Comfortable? 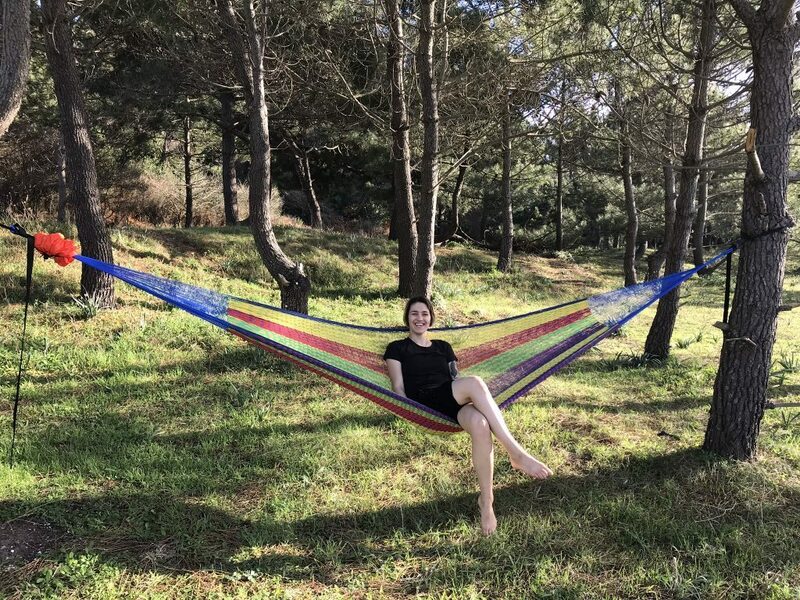 As the hammock is woven from individual threads to make a netting, the material stretches to fit you and a friend or turns into a cosy cocoon if you’re flying solo. The material is super soft too; I didn’t ever find that the string was cutting into my skin as some string hammocks do, and to be honest, it felt like I was floating on air. The design of this travel hammock is flawless, in fact, I’m going to go out on a limb and say that I have never relaxed in such a comfortable travel hammock. How’s that for a quote? Where Do These Travel Hammocks Come From? Viva Maca is brought to us by two brothers who spent their summers in Yucatan, Mexico, with family. They have fond memories of sleeping in the woven hammocks that are native and historical to this area, and now they try to remind everyone of all of the positive things that Mexico has to offer through their work while adding a taste of beautiful Mexican culture into your lives at the same time. They also want to do something to give back to the area that they spent so much time in as children. Each hammock is hand woven by men and women in Yucutan’s rural communities Mexico. Citizens and villagers use the hammock weaving to supplement their income and can carry out the work in their own homes and to their own schedule. Better still, all of the materials that are needed to make the hammocks are given to the weavers free of charge, so there is no need for them to put in any upfront cost. So simple that you could do it with your eyes closed. Each travel hammock comes wrapped in a handy sleeve that you can re-use to make sure that the individual threads don’t get damaged on the trail. Just attach the straps provided to your chosen trees and then to the hammock while still encased in its sleeve, and then pull back the lining to release the comfort! It really couldn’t be any easier! The hammocks from Viva Macca cost $120, which you might think is a little on the pricey side. 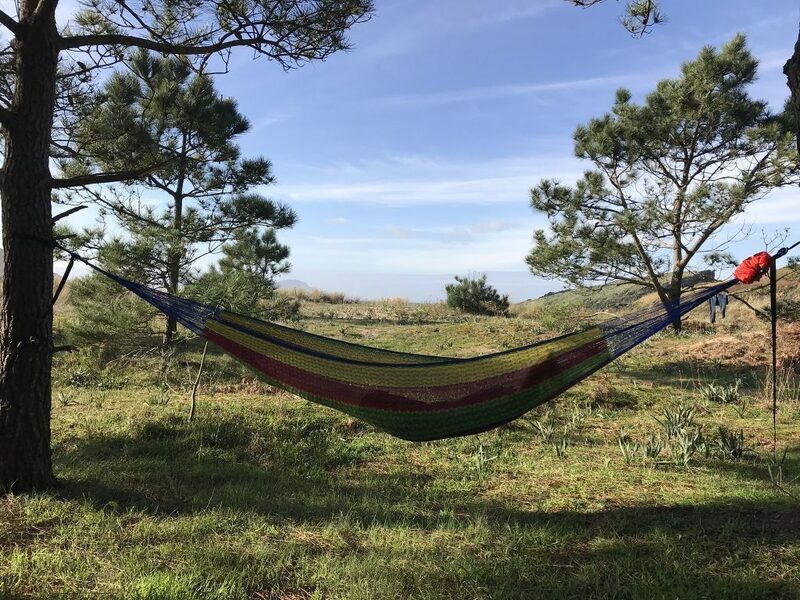 However, you will never need to buy another travel hammock again once you have a Viva Maca hammock, so think of it as making a lifetime investment; it really does tick all of the boxes. Plus, you can take it with you anywhere and everywhere; all you need is two trees! Be the envy of your friends at the beach, in the park, at the end of your hike, by the river, or just in your back yard. Better still, $5 of each purchase goes towards community projects to help better the lives of those in the Yucatan and the people who make these fantastic hammocks. Viva la fiesta: Viva Maca!! Full Time Van Life is no sacrifice, as this blog explains! This Nissan Camper has a fully stocked workshop in the back of it!